For the past few days I’ve been in Anchorage, AK visiting family and spending time with my grandmother (hence the slowness of blogging). I flew up here with my son and my parents in order to see her since she’s nearing the end of her life. The last time I saw her was about a year and a half ago when my sister got married and right after Cyril’s birth. In fact, her and my grandfather have come to just about every major event in our families lives (graduations, weddings, births, etc.). I lived up here in Alaska for nearly all of my childhood and being around them was simply an assumed reality. They have always been around, always. In fact, now that I’ve been up here spending time with her, all of the prayer requests and discussions I had about her in the past few weeks seem so foreign and removed. What I mean is that two weeks ago when I was thinking about her and praying for her and telling others about her, none of this “end of life” stuff seemed real. It seemed so far away and so… well, distant. But being here and holding her hand, feeding her, talking to her, and just spending time with her brings back a lot of emotions and makes this, as cheesy as it sounds, real. The memories are a deep well-spring when I think about her and my grandpa. I remember Grandma cooking the best Japanese food I have ever tasted. And all of the Japanese that I know, which isn’t very much, is due to her and Grandpa teaching me how to say “hello” and “thank you” and “please” and “let’s go.” My interest in Asian cultures stems largely from seeing the beauty displayed in Grandma’s life. The Japanese art work in this house is so beautiful, especially when surrounded by pictures of family. When I was a kid, my grandparents used to pick me up early on Saturday mornings and we’d either hed over to the “golden arches” or my favorite Alaskan breakfast restaurant, Gwennies. Gwennies has the largest portions of food you’ll ever see. I have no idea how that place stays in business because every meal is essentially enough for two. So Grandma and I almost always ordered the sourdough pancakes and shared. Grandpa often ordered the reindeer sausage platter and would give me pieces of the meat. After we ate breakfast, we’d head over to the air force base (Elmendorf) or the Anchorage airport to watch the “big babies” come in. That’s what we called the airplanes that we watched land and take off. You see, I was absolutely mesmerized by every and all airplanes. I wanted to grow up and be a pilot, so spending time with my grandparents while watching those planes land or take off was just a dream come true. After we watched the planes for awhile, we’d go shopping and Grandma always made sure to buy me clothes that fit. Maybe I wear baggy pants to rebel against her always picking out my clothes and making sure I looked like a “good little boy.” I didn’t want to look “good” and “little,” Grandma! But I did, thanks to her! My parents probably wished she shopped for me in high school and my wife probably wishes she did now. Yet she always let me pick out a t-shirt that I liked and would even buy me a toy (back then it was Transformers… which apparently is back in style). My grandparents have invested so much of their life into mine. Seriously, I don’t think I ever understood how much time, energy and, most importantly, love they have given me. But now, as an adult, I see that it’s much more than being about me… it’s about family. I have four children that are growing up quickly. And even though I’m not a six year old boy anymore, my grandparents have continued to be a huge part of our lives. Birthday cards for all of them… always signed with lots of love and hugs and kisses. They didn’t just love me and support me as a child, they continued to love me by loving my children. My mom and I were talking yesterday about them and she told me that every single gift she’s ever sent them is in this house. They treasure every piece of family memorabilia that they receive. You want to know what is the most important thing to my grandparents? Family. That’s why they write cards, hang pictures all over the house, make phone calls, send emails, etc. Grandma’s body is starting to shut down because she’s in the last stages of life. The doctor’s don’t know if she has Alzheimer’s or dementia. Every single time I walk into her room it’s like the first. She says, “Hi Lucas!” and then we catch up on life. When Cyril comes in the room, she gets so excited to see him and asks me how old he is and then we talk about all four of my kids. Grandma has been telling me every time she sees Cyril that he’s a “good looking boy.” She used to say that about me when I was a little kid. Now she just says I’m handsome. That’s the thing about my grandma’s love… it’s blind and always looks through the lens of “this is my grandson” (or great-grandson). Grandma’s short-term memory is all but gone and she is bed-ridden, which means she requires 100% care. Watching my grandpa serve her is amazing. If I can be like him when I grow up, I will be a good man. He’s doing such a great job. When I was growing up, Grandma was servant, par excellence. I mean, when you were going to eat… you sat at a table and she cooked everything, provided everything, cleaned everything, and did everything. It’s probably due to her being Japanese, but that’s just how Grandma is. In fact, you just take it for granted because it’s so much a part of her DNA. If I can be a servant like her, I’ll be a good man. She served, served, and served some more. Those of us in her family have had it made. And that’s what I think is so fitting about this stage of her life. She spent her entire life bending over backwards for the happiness of her husband, children, grandchildren, and great-grandchildren. We had it made, period. So it is fitting that she now is served hand and foot. It’s fitting that all of her food is cooked for her and served to her. Really, it is. I just wish we’d all done this awhile ago, when it wasn’t a requirement. You know what I mean? When I was fifteen years old, I spent the summer here and I wish I’d have told my grandma to take a seat and let me cook or clean for her. I know she wouldn’t have let me, but at least I’d have offered. Instead I’d come home, ask her what was for dinner, and then enjoy the most amazing Japanese feast under heaven. And I’d act like I deserved it too, because she was my grandma and I was her grandson. And to make it worse, she’d have told you that I did deserve it because I was her grandson! Grandma loves her family. Just the other day I saw how much she loves family. We’re feeding her throughout the day because the nurses have told us that we should give her whatever she wants, whenever she wants, how ever much she wants it. This means that along with the regular “meals” we are feeding her, she’s getting little treats. She loves, and I mean loves “oatmeal cookies.” That’s what she calls graham crackers. Hey, who am I to argue with her? I love them too. Every time she has a sweet she acts like it is the first time she’s ever had it! It’s so fun to watch! she loves those crackers though. 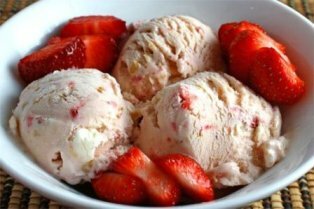 But if you really want to get her excited, mention strawberry ice cream. Seriously, she loves it. But what’s this have to do with family? Everything. The other day I asked if she wanted some, which is like asking me if I like books. It’s a no-brainer. Just get the ice cream, right? Of course she said “yes.” We’d just gotten done eating some ramen noodles, so I took our two bowls into the kitchen to put them in the sink and start getting her the ice cream. I get the feeling that I took too long because when I returned, she said, “Lucas, what took you so long?” I told her that I was putting the dirty dishes in the sink and that I wanted to get her a clean bowl and spoon because I’d been using the other one. I was basically trying to explain to my grandma why the most delicious strawberry ice cream was not being spooned into her mouth using my dirty dishes. And that’s when I really understood how much she loves her family. She said, “Lucas, we’re family. I don’t care about your dirty spoon.” Grandma loves her family. Grandma loves her family. She loves her family so much that she has spent nearly 80 years of her life living for them and has cooked and cleaned and listened to us and taught us throughout every second of our lives. She’s sacrificed everything for us. She’s babysat us and changed diapers and attended the big events in our lives, be it weddings or hockey games. Her and Grandpa have set money to us for every birthday we’ve experienced and given so much of themselves. We are all better because of their love. And we’ve seen Grandma’s love from day one in every way imaginable. I thank God for my grandparents. I thank God that they have been in my life since as far back as I can remember and have invested literally all that they have into my life, my wife’s life, and the lives of my children. I know they love me. And I know Grandma loves me because she has given, given, and given some more. And she’ll share a spoon with me… because we’re family. This is simply beautiful, Luke. My parents live in Hiroshima, and my two brothers are married to Japanese and half-Korean women respectively. Hey, you have such tenderness. Thought you were all testosterone……he! he! I’m glad you’re there with your grandma. Family and the deep, deep love God created in a family is how He meant it to be and anything that comes between you and your love for your family literally rips your heart out. Death of a loved one brings to reality that we are just passing through this world. It is not our home. Savor and enjoy these precious moments with Grandma. Ponder them and hold them deep in your heart with the hope that we have of seeing them in eternity. Every family member is a gift to you from God. Sounds like you’ve already been blessed. And today we learned that Jesus shared a cup with the woman at the well……He wanted her to be family!